Armenian Defense Minister Seyran Ohanyan, Police Chief Vladimir Gasparyan and other representatives of the top brass personally talked the family of an army conscript killed recently by a fellow soldier out of taking his body to the capital as a sign of protest as the procession was blocked on the Sevan-Yerevan highway earlier on Saturday. Lyuks Stepanyan, 19, was shot dead by another conscript in a military unit in the northeastern Tavush province of Armenia on May 15 in an incident in which another soldier, Hrachya Sargsyan, was seriously wounded in the head and is now said to be in a heavy condition at a military hospital in Yerevan. David Khachatryan, a 20-year-old conscript from the same military unit, was arrested on suspicion of committing murder “in a way dangerous for the life of many people”. The parents of the killed soldier, reportedly infuriated by the lack of due attention from the military authorities in the wake of the incident and doubting that an impartial investigation will be conducted,, planned to take the body of their son to the government building in Yerevan where scores of civil rights activists and mothers of other servicemen killed in the ranks were holding a protest today. 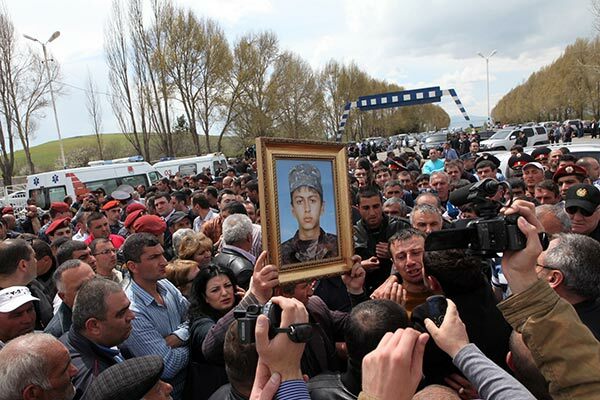 The police, however, blocked their way and the high-ranking officials who came to meet them reportedly managed to convince them to return to their native village of Verin Getashen to organize Stepanyan’s funeral there. Some clashes between relatives of the killed soldier and police officers were reported in the process. Defense Ministry spokesman Artsrun Hovhannisyan said Minister Ohanyan had assured the Stepanyans that an unbiased and thorough investigation will be conducted and that all those responsible for the deadly incident will be punished. He also denied that the military authorities had not given the killed soldier’s family due attention after the death of their son.